It has been explained over and over again that zombie apocalypse is not scientifically plausible. However, in the spirit of prevention and preparation in case some weird stuff happen in the Large Hadron Collider, here are some cool survival gadgets and some useful gear to have. Review: if you intend to carry some notebooks and pencils, get a smaller bag. This is an all-in-one container for all your devices and a big bottle of water. Review: it is neither Victorinox nor Wenger indeed, but it is pretty close to that. You can play MacGyver and no one will notice that you have a different type of knife. An alarm is handy in all emergency situations regardless of where you are and what you do. SOS Personal Alarm is small and lightweight, yet it can produce 120 decibel sound (ambulance-level). Price starts from $17.61 – $20.00. Review: all you have to do is pull the pin and the alarm will go off for about 30 minutes. It is also useful to scare away a bear or two. The blade is made of carbon stainless steel. The handle is designed for both left-handed and right-handed people. It is manufactured by the same company that makes Smith and Wesson Knives. Price starts from $34.79. Review: despite its small form factor, this is not a toy. There is locking mechanism to prevent the blade from popping out in your pants. Instead of folding the tools inside a handle, this outdoor survival tool is in a hexagonal shape with easy access to all tools. It has a bottle opener, saw blade, wire stripper, hex wrenches, and more. Review: this thing is so small, and the bottle opener is a bit difficult to use. It is still a good introduction to multifunction knife for kids. As the name suggests, this sleeping bag should be used in an emergency situation, for example when your main sleeping bag is gone. You can pack it into the small dimension and it weighs only 4.7 ounces. Price starts from $19.97. Review: the best thing about this sleeping bag is that the material is waterproof and tear-resistant. Everyone should have one. It is a hollow tube keychain in which you can store two or three US bills. This cash capsule is made of aircraft-grade aluminum material. It is also waterproofed to keep your money dry. Price starts from $7.14 – $9.15. Review: the product is marketed as capsule for money, but you can use it for other things too such as medicines. Fold the money carefully so you don’t tear it apart. A small blade can go a long way in the emergency situation. This folding knife has a blade made of chisel-ground CPM S30V and a handle made of titanium. Blade length is about 1.2-inch. Price starts from $77.97. Review: it is so small that you can almost call it cute. The knife is quite fancy enough to go with an expensive purse, too. Ready-made hand warmer is always easier to use than making a fire in the middle of a snowy jungle. Zippo Hand Warmer is an easy elegant way to prevent your hand from freezing when you are fishing during winter. Price starts from $12.92 – $12.92. Review: you can even put the hand warmer inside your shirt pockets in case you forget to bring a jacket. It is easy to use and can produce warmth for about 12 hours between refills. Review: the manufacturer says it has 45 different functions. To name a few, you can use it as pet collar or tie criminals to a tree. A personal and portable water filter is a must-have gear for outdoor adventures. LifeStraw features a filter that keeps anything down to 0.2 microns away from your throat. Review: a single filter can filter up to 1000 liters of contaminated water and change it to healthy water. No one should forget to carry water on a hike, but it is good to have contingency plan. Solar power is the future. This flashlight comes equipped with built-in rechargeable battery and cranking mechanism. Crank for 6 minute to produce electricity for an hour of lighting. Price starts from $8.95. Review: with just about 5 – 15 lumens, the flashlight is good for indoor use. Crank it up and you don’t have to be afraid of the monster under the bed. You can probably conquer the highest hills in your backyard, but you still have to cook for dinner when camping. The camping cookware features FDA-approved non-toxic anodized aluminum material and it includes 10 pieces of cooking/dining utensils. Price starts from $19.95. Review: pots and bowls are good quality, albeit small. They are big enough to contain a meal for a child, so your kid can still enjoy convenient dinner outdoor. A bottle of Potable Aqua contains 50 tablets to neutralize contaminated water and make it safe for drinking. Two tablets can deactivate bacteria in a quart of water. Best used when the water has been strained through a piece of cloth to remove debris. Price starts from $7.95. Review: it takes about 30 minutes before the tablets have any effect on the water. You can use more tablets than the recommended amount to be sure that the water is drinkable. 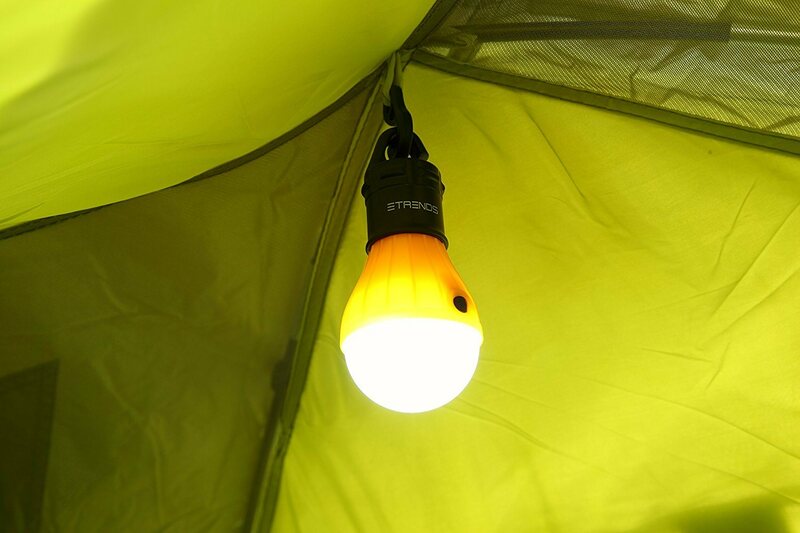 With a maximum output of 150 lumens, this portable LED bulb can bring light to an entire campsite. It has dimmer feature to conserve battery life too. Price starts from $9.99. Review: a package contains 2 bulbs. They are useful for hiking or fishing especially if you are afraid of the dark, in which case, you should not go hiking or fishing at night. The emitting brightness level of 300 lumens, Camping LED lantern is more than enough to brighten up even the biggest camp you can build. The battery provides 12 hours of regular use. Review: half a day of light with 3 AAA batteries is not bad. The lantern is also water-resistant, so yes you would be able to tell what fish you catch when fishing. This flashlight-like container is made of aluminum alloy. The available space is about 7.8cm long and 2.4cm in diameter. It is small, yet it gets the job done to store medicines, money, and other small items. Price starts from $9.98. Review: this is a good method to keep medicines and other stuffs in two separate containers. Your pills and vitamins will not get mixed up with dirty laundry, for example. Package contents three high suction cups (two large cups and one small cup), scalpel, lymph constrictor, as well as an antiseptic swab. The instruction manual is provided. Price starts from $8.49. Review: this product is called Snake Bite Kit but it does not make you a doctor in an instant. In actual snake bite case, you don’t want to use your DIY skills for the treatment. Ask a professional to use the kit to treat you. Review: it does contain a lot of things, but all of them are quite difficult to access. If you can spend 15 minutes unraveling the cords, this kit is probably good for you. Designed to be disposable blankets, these thin layers of reflective materials prevent loss of body heat. The whole package is small enough to fit any backpack. Price starts from $6.70 – $37.25. Review: the first thing to notice is that these blankets are marketed as disposable. They are not expensive, and they do what they promised to do. As long as you can sleep without fancy silk blankets, these kits are useful. Review: with 20 meals and 12 servings of whey milk, you should be able to survive for several days or more in the wilderness. Of course, you can also learn how to fish before you run out of milk. Review: it has a spoon, fork, knife, and bottle opener. It is among the best cool survival gadgets, especially if your outdoor adventure is full of meal. Whether or not you care about styles, those cool survival gadgets can help you go through the difficult days on hunting and scavenging in the wild. Although some of them work better for a picnic than mountain hike, they are at least functional and affordable.